Paros Airport - Everything you need to know, transfer, location etc. Paros Airport: few useful info about our new arrival gate. Paros airport started its operation in July 2016. It was built ground-up and it has replaced the old and small Paros airport. 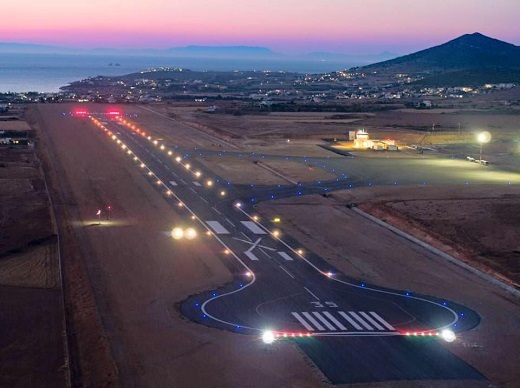 The new Paros airport is located in Aliki area, at southwest coast of our island. The distance from Parikia, the capital, to the airport is 10 km and from Naoussa, the distance is 18 km. It is useful to know also the distance to the small port of Pounta, from where you can take a ferry to Antiparos island. The airport is connected by local bus line with Parikia and Naoussa, the two biggest towns of Paros. Also during the tourist season, it is also connected with other main areas of Paros. To get to your destination, you can also take a taxi or rent a car. Our hotels can make the necessary arrangements for your transfer from the airport. Just notify us on time, few days before your arrival by sending email to the hotel you will stay in. In case you have arrived early in Paros and you have rented a car, there are some attractions you can see near the airport. So, if it is too early for a check-in in your hotel, you can go to Aliki, a quiet costal settlement. It has a nice sandy beach, it is well-known for the seafood served in its taverns and it has many cafes where you can relax. You can also take the opportunity to see the east coast of Paros. By taking the road towards Aliki (southeast), you can drive to e.g. Naoussa village, using the road that crosses the east coast. It is quite straightforward so you will definitely not get lost, even if it is your first time in Paros!